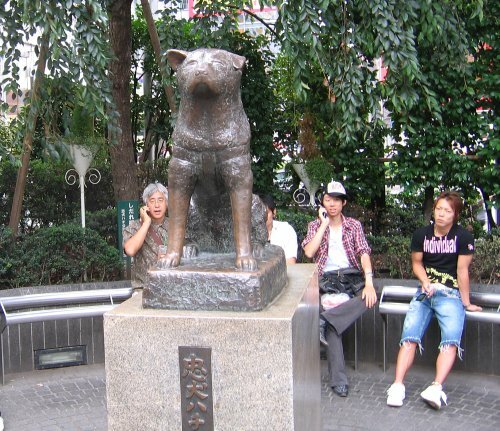 Have You Heard of Hachiko?? Wow, I have barely even started this post and there are already tears all over my keyboard. That can’t be good for my computer. Well, a few days ago I was innocently sitting down to watch Cloudy With a Chance of Meatballs for the first time, (which is a really funny, cute movie by the way. The ending drags on for 10 minutes too long, but I was pleasantly surprised by how much I loved it and how many shots were pulled directly from the illustrations of the book) when I was hit with this unexpected movie trailer. Whoa. I just tried to watch it again, but I only made it about a minute in before I lost it. Anyway, the trailer is for the movie Hachiko: A Dog’s Story, which I had never heard of before. Apparently it is being released straight to DVD, which is kind of sad considering it has Richard Gere and Joan Allen in it, who are pretty big names (not to mention a GORGEOUS dog). Well, I cried like a baby the first time I saw it, and then tried to forget about it and move on with my life. Then I saw this post on EW that talked about the trailer and I couldn’t help but think, “I wonder if that is based on Greyfriars Bobby?” For those of you who don’t know, back in long ago Edinburgh a cute little dog named Bobby followed his owner (who happened to be a policeman) everywhere he went. Then, when his owner died (sniffle, sniffle) he spent most of the next 14 YEARS sitting next to his owner’s grave. 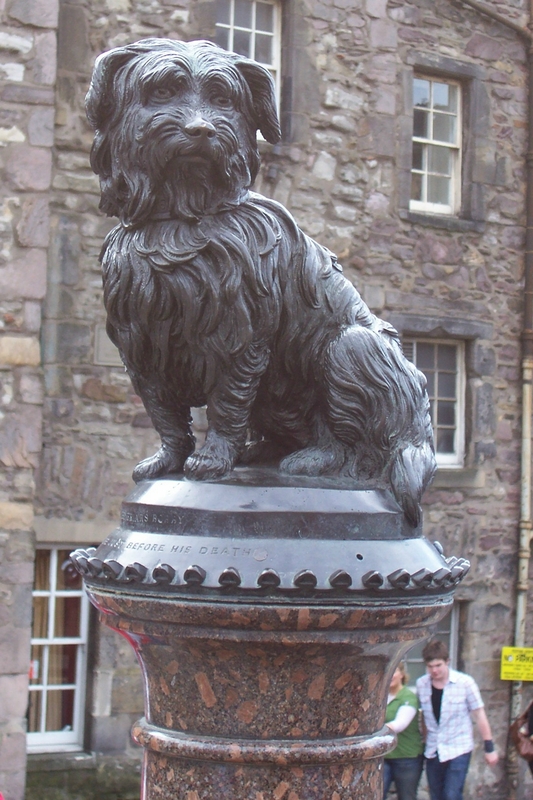 The cemetery was named Grefriars Kirkyard and that is how he became known as Grefriars Bobby. Well, you can imagine how my mom and I looked after our nice tour guide told us this story while standing in front of the statue dedicated to this loyal little guy. Needless to say we were both sobbing hysterically enough that people were muttering “silly Americans.” Here is my very own picture of the statue. Luckily my tears did not interfere with the shot. Well, I looked into the movie Hachiko and it is not based on that story!! It is based on a story from Japan where the dog went to the train station every day for 9 YEARS (or 10, there seem to be different numbers in different places) to wait for his owner and there is a statue at the train station in Japan of him. As much as these stories make me cry like a little baby, I adore hearing them. It so goes to show that anyone who says that animals don’t have feelings or emotions is just plain wrong (and pretty ignorant). It totally reminds me of what happened when I went off to England for three weeks (obviously to take pictures of the Greyfriars Bobby statue) and left my cats with my parents. Apparently Addie spent almost every afternoon staring at the front door, which was where she last saw me, just waiting for me to come back. I will never forget how she jumped into my arms as soon as I got home. Hermione (my other cat) just gave me a haughty look and turned her back to me, but that is pretty normal for her. Oh pets……what would we do without them? So, I hope that some of you guys will take the time to watch Hachiko. I know that I would be emotionally ruined for days (and probably really dehydrated) if I sat down to watch it, but hopefully some of you will watch and enjoy it for me. P.S. Don’t you think the MPAA should have to put a warning before trailers that are really sad? Something like, “this motion picture has been approved for all audiences, but you might want to grab a tissue.” I haven’t cried this much at a trailer since Under the Same Moon played before Juno. I heard today that Martin Scorsese is going to direct the movie adaptation of The Invention of Hugo Cabret. Whoa. Now I will admit that I have never seen a Martin Scorsese movie. His movies aren’t really my thing. If he ever did a romantic comedy, raunchy teen comedy, or a kids movie……oh wait, I guess he’s doing a kids movie now. I am not sure what to expect out of this movie. When I first read the book, I thought it was amazing! I was mesmerized by the pictures and the whole atmosphere that was created just by holding the book in my hands. It was such a unique experience to sit and read it that I couldn’t stop thinking about it afterward. I told everybody I saw how awesome it was. I think the ONLY reason why that book is great is the format and the illustrations. If it didn’t have that, I think it would have faded into obscurity. So my big question is, how are they going to make the film special??? Obviously one of the ways is to hire a big time Oscar winning director. I’m hoping that they incorporate a lot of action straight out of the book’s illustrations. Other than that, I don’t know what to expect at all. So, what do you guys think? Will the movie be awesome? Am I totally wrong about the story? What would you like to see in the movie? I’m ready for another round of books read for the Countdown Challenge! You can check my progress by taking a look at the list of books I’ve committed to read. Since my last review, I’ve read three more books. This one didn’t hold my attention as much as Fleming’s Lincoln biography, but I still learned a lot of things I didn’t know. There were a few times I wished it were about Lou Hoover instead though. 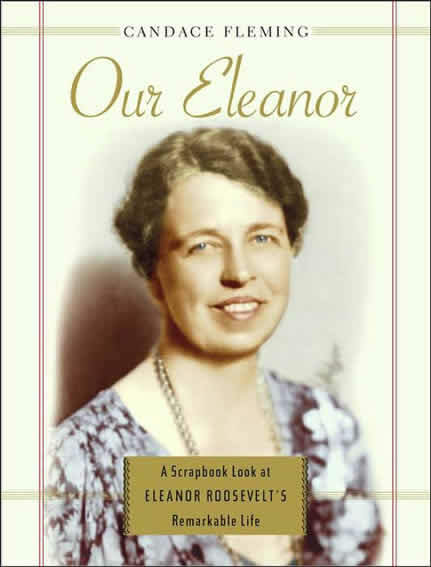 🙂 If you’re a nonfiction reader or if you don’t know much about Eleanor Roosevelt, I’d recommend this one. 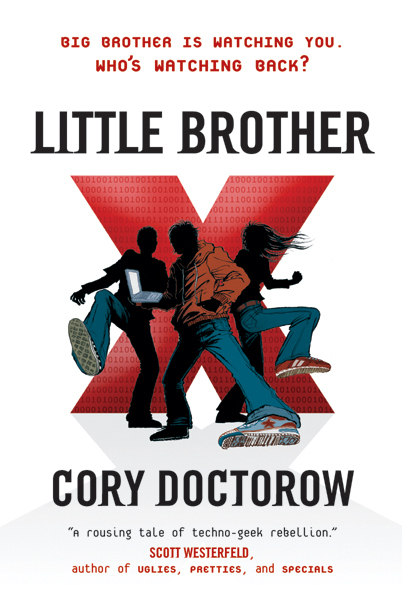 Marcus Yallow was just an average high schooler with an above average knowledge of how the Internet, computers, and technology work…until a terrorist attack hits his hometown of San Francisco. Suddenly he and his friends are believed to be terrorists and get picked up by the Department of Homeland Security. After finally gaining freedom from DHS custody, Marcus fights back against the paranoia and loss of rights as the government begins to carefully watch San Francisco citizens’ every move. I had been wanting to read this for awhile, but honestly, it wasn’t as good as I was expecting. I liked the idea, but it dragged on a little too long. Plus, there is A LOT of tech-speak in it. Most of it is explained, so it’s ok, but be prepared to either let stuff slide over your head or learn a lot. It did make me more interested in reading 1984 since I never have. Another book I had been wanting to read for awhile – which is why it was on my list. I’m glad a graphic adaptation exists for the 9/11 Report. It’s a great way for average Americans to find out more information on 9/11. (Hopefully that doesn’t offend anyone. Really, how many average people read 500+ page books?) Anyway, this one fulfilled two goals of mine: learn more about the world/read more nonfiction and read more graphic novels. 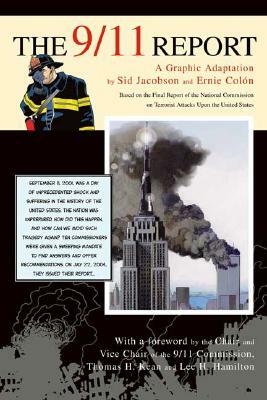 Unless you’re planning on picking up the full 9/11 Report, I suggest reading this graphic adaptation. Has anyone else read any of these? What did you think? My Review of Leap Year…A Startling Discovery! I have now seen Leap Year many times (I am embarrassed to admit how many) and I loved, loved, loved it (to quote Mr. Darcy)!!! It was everything I wanted it to be and more. Amy Adams was precious, the scenery was mouthwateringly gorgeous and so was the leading man played by the fantastic Matthew Goode. It also turned out to be rather funny, which is more than I can say for many romantic “comedies” I have seen lately. It also turned out quite well in the end (obviously) and so I simply adored it. But I couldn’t help thinking the whole time I was watching it (sorry, times I was watching it) that I have seen this before. Not only have I seen it before, but I have seen Matthew Goode doing it before. I realized that Leap Year (I keep wanting to call it Leap Day for some odd reason) is essentially the exact same movie as Chasing Liberty!!! The only difference is that Leap Year is a movie for grown ups and Chasing Liberty is a movie for teens (and also, it rains a whole lot in Leap Year). Those are basically the only real differences, everything else is the same. Now I wonder if Mr. Goode noticed these things while he was reading the script or if he has completely blocked his first movie out of his memory and had no idea how similar the two were. I adore both movies, but Leap Year is my favorite of the two. I think it all comes down to me preferring Ireland to Europe, Amy Adams to Mandy Moore, and a scruffy, grumpy Matthew Goode to a clean-shaven, boyish one. 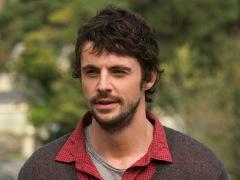 So, if you haven’t already, go see Leap Year, it is really great. The people that I have seen it with all really enjoyed it and I could tell that the rest of the audience did too. But go see it fast, because I doubt it will be in theaters for very long. With Avatar still dominating and more movies coming out all the time, I can see this one falling through the cracks very quickly. 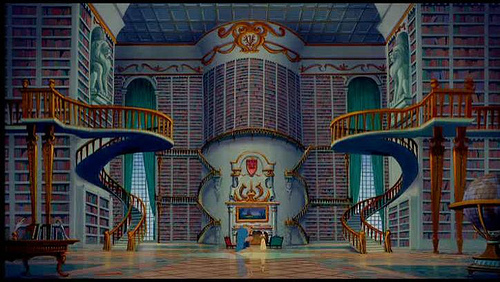 I already have a big list of things that have to be included in my future house (a Beauty and the Beast sized library with rolling ladders, cubby holes to hide the litter boxes, a garage, and a DECENT HEATER!!!) and now I have something else to add to it. 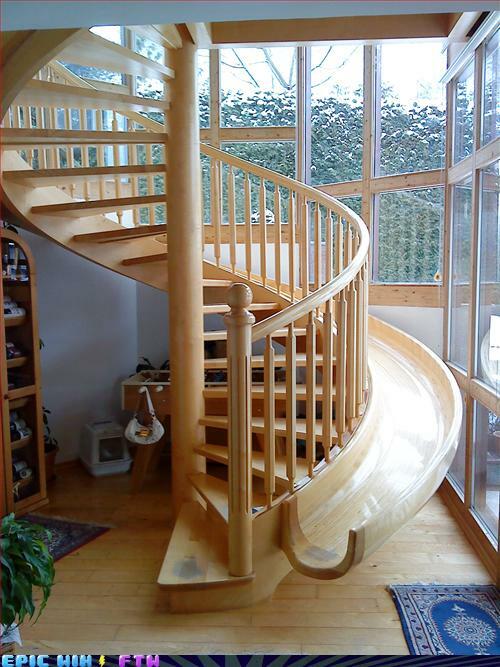 Although, I probably would make the slide a little wider…..For some reason it looks like it might be a little snug after many years of vegging out on the couch. Also, I would want more support on it as well…..can you imagine if you were halfway down and it disconnected from the stairway…..Ouch! Courtesy of Epic Win. Thanks to @jpetroroy for tweeting about it! A World where it is ALWAYS SNOWING! P.S. You can search for my snowflake! It is #9264324!